The following post is sponsored by Brooks Running. For our sponsored post policy, click here. Love that quote? Us, too. And it’s just one of the reasons why we’re pumped to share an exclusive interview with Brooks Beasts member Katie Mackey. She’s been with Brooks Beasts since it was created in 2013 and has PR times of 4:04 in the 1500m, 15:04 for 5K, and she ran on Team USA in last year’s IAAF World Relays 4x1500m team and placed second in the mile at the 2015 USA Indoor Track and Field Championships. Plus, she’s just downright cool and runs for all of the right reasons. 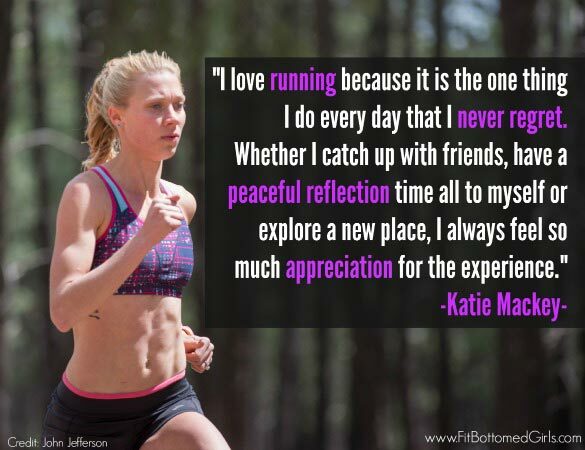 Read on for our Q&A with Katie and prepare to get inspired to go out for a run yourself! Why do you love running? I love running because it is the one thing I do every day that I never regret. Whether I catch up with friends, have a peaceful reflection time all to myself or explore a new place, I always feel so much appreciation for the experience. What motivates you each day to keep training and working toward your goals? I love running, it’s fun — that certainly helps! When I’m running, I feel like I’m doing what God made me good at, and that he is smiling down on me when he sees how much I am enjoying myself. Of course, there are days when all I feel like doing is laying on the couch like a slug! On those days, my teammates motivate me to keep moving toward my goals. Their positive encouragement and daily commitment to me and the rest of the team makes those days less painful. Speaking of goals, what are your current running and healthy living goals? This year I would love to make a World Team and represent Team USA in Beijing! To do that, I’m constantly piecing together little goals along the way — like eating a clean healthy diet full of fresh foods that will keep me recovering my best and hopefully injury free! One of the other goals I’ve been working on this year, as weird as it may sound, is managing emotions — not only at the big meets, which are obviously a challenge, but also seeing distractions every day at practice as a way to make my ability to re-focus and be in the moment stronger. There are many ups and downs over the course of a running career; it’s life! The ability to keep moving forward with a positive and hopeful attitude is invaluable. You’ve been a Brooks Beast since its creation. What’s your favorite part of being one? I love being part of a team, it’s such a rewarding experience. The bonds that are created through miles of sweat, laughter and sometimes tears turn into lifetime friendships. There’s nothing like an encouraging word from a teammate when you need one, or the feeling of pride when your teammates accomplish their goals! What’s your favorite running memory? What comes to mind first is running up in North Park, Colo., with my dad while growing up. I have two sisters and sometimes they would run with us but I really just enjoyed getting my dad all to myself for hours at a time. I feel fortunate to have had my dad’s input on many of my trivial teenage dilemmas; the advice is still largely applicable! Many of my memories from there are also unique because of the encounters with wildlife — one time this antelope ran several miles alongside us, about 200 meters away. He just kept jogging and then stopping and waiting for us to catch up; it was the weirdest thing! Animals are so beautiful when they run, and I’ve been entranced with antelope ever since. Do you run to tunes? If so, what are a few of your current favorites? Yes! The catchy songs that keep getting stuck in my head are usually the same songs on my running playlist, and so I listen to them a million times and then never want to hear them again, so they are constantly changing. Right now the top three are “GDRF” by Flo Rida, “Welcome to New York” by Taylor Swift and “Stuck on a Feeling” by Prince Royce. If you could run with anyone, living or not, who would it be? I feel like Ellen DeGeneres would be a kick to run with. What a funny little story with the antelope, so cute! She seems very inspiring!